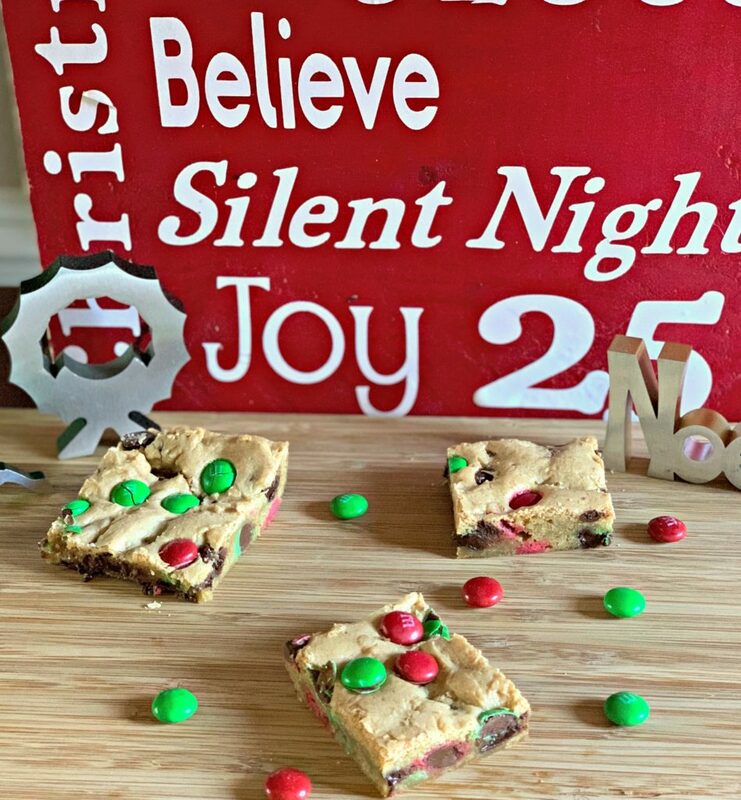 These Christmas M & M Cookie Bars are the perfect Christmastime sweet treat! Gooey, soft, and fluffy cookie bars packed with both chocolate chips AND M &M’s!! This past week, my kids school PTO hosted a cookie exchange for all the teachers! Several moms signed up to bring two dozen cookies each, me included. Since my schedule has been so busy lately though, I knew these cookie bars would be perfect! Rather than having to scoop cookie dough individually, I was able to prepare the dough, spread into a pan, and once baked….cut into 24 bars! By adding the Christmas M & M’s, they were quite festive too! These cookie bars are the perfect addition to goodie trays around the Holidays because its a bar everyone enjoys! 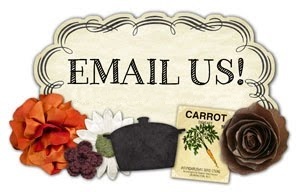 It adds a new shape to the tray (square versus circle), and the colors are easily adaptable to any color scheme desired! 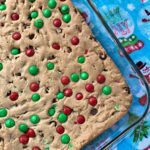 The cookie bars themselves are incredibly soft and fluffy, packed with just the right amount of chocolate chips and M & M’s, and a family favorite! You can even prepare the batch and freeze for later! My kids enjoy pulling them out from the freezer, popping one into the microwave for about thirty seconds, and enjoying with a glass of cold milk. Tastes like it just came out of the oven! 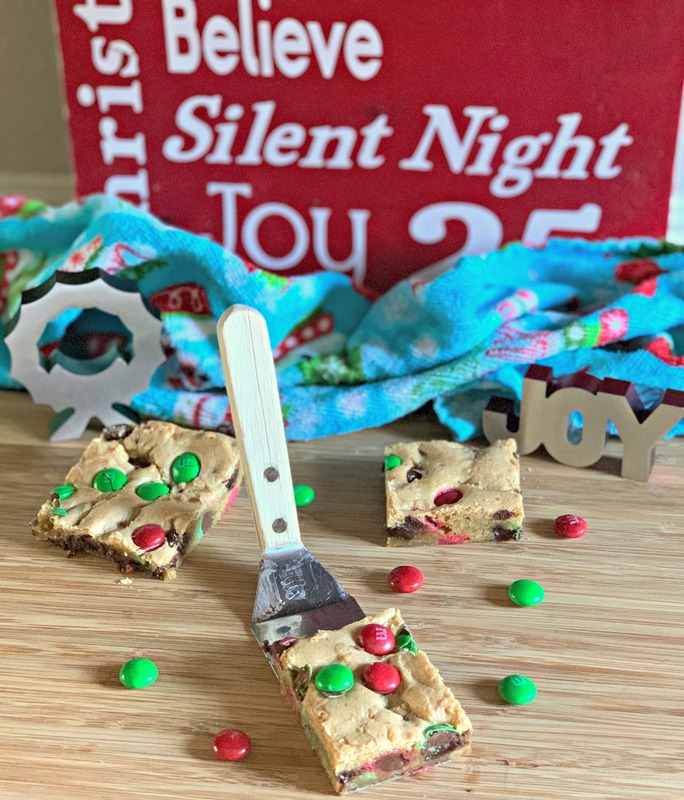 If you’re looking for a quick and easy cookie idea to add to your trays, serve for company, make for friends/family/teachers, or to simply enjoy for yourself….look no further! Hope you each have a wonderful Holiday season!! 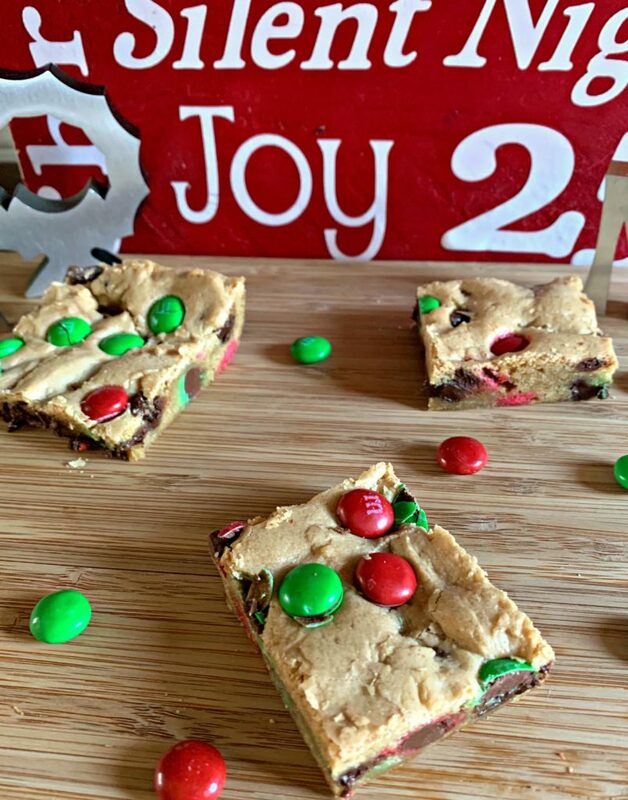 These Christmas M & M Cookie Bars are the perfect Christmastime sweet treat! 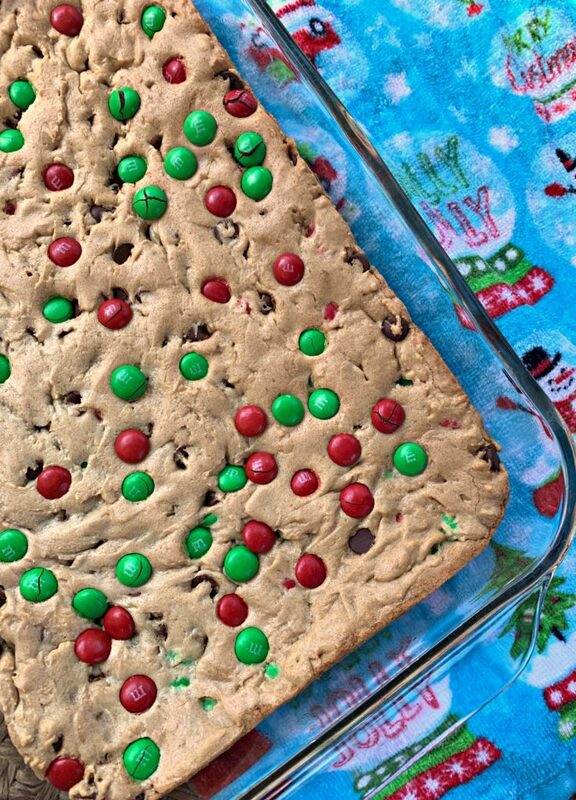 Gooey, soft, and fluffy cookie bars packed with both chocolate chips AND M &M's!! Preheat oven to 325 degrees and grease a 9 x 13 baking pan. In a small bowl, melt the butter in the microwave. Set aside to allow to cool slightly. Add the brown sugar, white sugar, egg, and vanilla extract to the melted butter. Once combined, slowly add in the flour mixture and stir until just combined. Fold in the chocolate chips and 1/2 cup of M & M's. Sprinkle remaining M & M's on top of spread dough and lightly press into dough. Place pan in preheated oven and bake for about 25-30 minutes. Remove from oven and allow to cool slightly before slicing and serving! Are you on Instagram?? I am too! 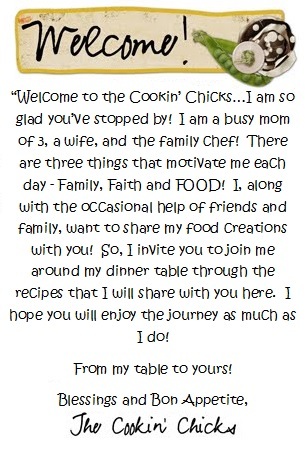 Come find me here, https://www.instagram.com/thecookinchicks/, and use the hashtag #thecookinchicks if you make these so I can check them out too!! Here is the 9×13 baking pan I use, https://amzn.to/2Ehd14Y, its part of a set that stores perfectly!! Yea! Glad you enjoyed them! Change up the color M & M’s for St Patty’s Day coming up!